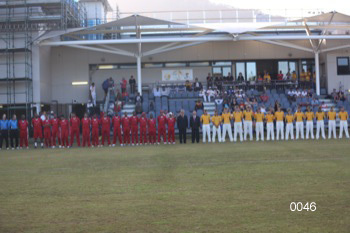 U16 Tri Nations 20/20 Final | The International Cricket Hall of Fame. The Australian U16s Schoolboys recorded a …run victory in a low scoring encounter, that saw them win the T20 Final and exact revenge on the West Indies after yesterday’s final over thriller. On a Balmy evening at the polished University of Wollongong Cricket Ground, the West Indies won the toss and sent the hosts in. They were soon questioning this decision when Australia made a blistering start and were 0/23 at the start of the 3rd over. 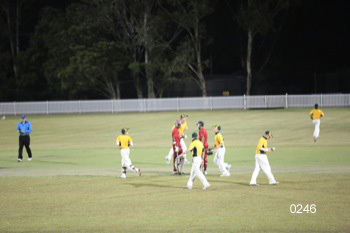 But in true Caribbean style, a diving catch at backward point from Simmons ended the dangerous Bryce Streets innings to end with an entertaining 18 off 12 balls. The West Indian spinners then mounted the pressure on the Australians and pick up some key wickets in the process to take control at 3/58 after 10 overs. Gauci and Thomson steadied things and took the score on to 76 by the start of the 14th before Thomson was beautifully stumped be keeper Jangoo. From here the Australians never recovered, losing consistent wickets to be bowled out in 19.2 overs for 103. The destroyers for the West Indies were Boodram and Bootan with the figures of 3/12 off 3.2 overs and 2/18 off 4 overs respectively. The Windies were magnificent in the field with a mix of run-outs and catches that fully showcased their athleticism and skill. The Australians got themselves firmly in the match through by not conceding a boundary inside the first 6 overs and holding the Windies to 0/23. Opening Bowler Seymour, bowled his first 4 overs at the top of the innings and produced figures of 1/6, almost unheard of in T20, particularly in the power-play. A sensational run out from Blake Thomson (nothing short of Ponting-esque) then brought the skipper and Champion T20 player to the crease, Kristan Kallicharan. At 2/28 in the 8th over and in difficult batting conditions the Windies needed something special. the Australians favour, despite danger man and captain Killacharan still at the crease. The Australians strangled the Windies mercilessly in the closing stages, to complete a comprehensive victory. The West Indians finished at 9/85 off their 20 overs with Killacharan the top scorer with a well-made 34 form 33. Skelly was ruthless at the death with 3/9 off 3 overs. It was a brilliant match that again ebbed and flowed from team to team. Tonight the Australians were too good, but all three teams are sure to challenge for the upcoming One Day series which commences on Saturday at Bradman Oval with Australian playing India and Sunday Australia Playing West Indies 10 to 4.30 pm. The Bradman Foundation are hosting the Tri Series with India, Australia and West Indies residing and playing in the Highlands for two weeks.